We have the tools and materials necessary to replace any graphite or steel golf club shaft. Improve your golf clubs and shop for new shafts that fit your game. Bore-through golf clubs require a different shaft installation process. Trust the RIGC Certified Club Technicians who have been trained to install bore-through shafts. If your shaft is broken or doesn’t fit your swing, you can have it removed by a RIGC Certified Club Technician. We have the tools to remove graphite or steel shafts without damaging other components of your golf club. Is your club too short? RIGC’s Certified Club Technicians have the tools necessary to add an extension to your current shaft so that it better fits your game. 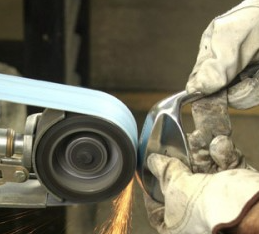 While a simple procedure, there are some intricacies to regripping your clubs. RIGC’s Certified Club Technicians are skilled in removing and installing golf club grips, and making sure you have the correct size grip. Want to save your old grips? RIGC’s Certified Club Technicians can remove most grips without damaging their structure. Golf Grips are an inexpensive way to invigorate your golf clubs and give you a sense of confidence to your golf swing. If your grips are cracked, slick, have wear spots or just plain look bad, a new set of grips could save you 3-4 strokes, and $$$. Loft and lie adjustment involves the use of specially-designed equipment and a great deal of experience. Certified Club Technicians use methods and procedures to bend golf clubs. We have the knowledge and science to meet your individual loft and lie specifications. Many clubheads require a ferrule, or plastic trim piece that provides a transition from the hosel of the clubhead to the shaft. RIGC’s Certified Club Technicians can replace a broken or worn ferrule. If your club head is loose or has become unattached from the shaft, don’t go buy a new club. RIGC’s Certified Club Technicians can install the head correctly and re-epoxy the head so it is returned to a like-new state. Small components can come loose inside your golf clubs, causing an annoying rattle that may distract you from your game. Have that rattle removed at Rochester Indoor Golf Center. WHY GET CUSTOM FIT FOR YOUR GOLF EQUIPMENT? A golf swing is all about angles. The fewer angles you create, the simpler your golf swing is and the easier it is to consistently deliver the club head to the ball in the proper position. Every extra angle that is created in a golf swing requires a compensation to return the clubhead squarely to the ball. And the quickest way to create unnecessary and unwanted angles is with improperly fitted golf clubs. Golf is hard enough to play – we all know that. You want to whittle away as many variables in the hunt for par as possible. Stop in and visit RIGC to discover how we can lead you down the path to the best custom golf shafts fitted for your swing. Once you know your golf shafts have been fitted properly and bad shots are still coming you know it is time to go to work on that swing. How much does it cost to be custom fit into the right clubs at Rochester Indoor Golf Center? $0!!!! We WANT you to continue to come back, knowing you had the absolute best service and clubs for YOUR game. It’s free service we offer with the purchase of clubs at RIGC. Stop in today, and get the clubs that are right for you! If you think reading a launch monitor and saying “You’re spin is too high, try this” is all there is to club fitting, think again. There is an art to the science behind all of this, and the folks at Rochester Indoor Golf Center have DECADES of experience fitting our customers. We invite you to come experience all Rochester Indoor Golf Center has to offer.